The company will remain in Houston but move to a more sustainable building. Waste Management has recently signed a contract to consolidate its two Houston headquarter locations into what it calls the most sustainable office tower in Texas in 2020. The New York-based Skanksa USA, which is developing Capitol Tower in Houston, has announced that Waste Management is moving into the building in late 2020. Waste Management will occupy 284,000 square feet across nine floors in the building at 800 Capitol. All of its current employees—roughly 1,000—now work in two locations, and they all will make the move to the new headquarters. “The move to a new corporate headquarters is one part of our overall efforts to create great spaces for our employees to thrive, and to demonstrate our continued commitment to sustainability,” says Jim Fish, the president and chief executive officer of Waste Management. "This new work space is one of the many ways we are focused on investing in our people. Additionally, the building will be one of the most sustainable office buildings in Houston and supports our company commitments to conserving natural resources." Skanksa says that when the tower opens in 2019, it will be the most sustainable office tower in the state, using 25 percent less energy than typical baseline facilities. The company adds that the building is one of only four core-and-shell projects in the country to be pre-certified under LEED v4 Platinum. The building will feature a number of green amenities, including the 24,000-square-foot SkyPark, which Skanksa says is first and largest green roof in Downtown Houston to be open to all building tenants. Other sustainable features include: a 50,000-gallon rainwater collection system for reuse in landscape irrigation and restrooms; 90 percent access to daylight and views for tenants; a façade that significantly reduces solar heat gain; an energy recovery wheel to precondition fresh air intake; and district cooling to provide chilled water throughout the facility, lowering cooling costs. “The new offices in Houston, which we will move into in late 2020, will provide us with an opportunity to create a unique space that will support our company strategic pillars and drive innovation and the use of technology. This move is also a reflection of broader initiatives to invest in our people, and creating work environments that reflect our focus on service, safety and community,” Fish says. Waste Management has also built and upgraded several facilities across its company this year, including opening a $14 million recycling facility in May known as the Sun 14 Recycling Facility in Davie, Florida. The company has also built a new Driver Training Facility in Bremerton, Washington, which was modeled off of its existing facility in Fort Myers, Florida. Waste Management also invested in a new sales center in Phoenix, Arizona. 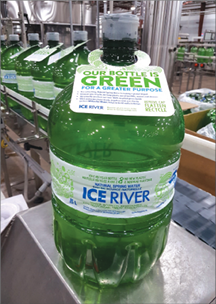 Shelburne, Ontario-based Ice River Springs, which was founded in 1995, claims to be the only beverage company in North America that operates a closed-loop recycling facility and makes 100 percent recycled content bottles for its water. But the company’s husband-and-wife ownership team has experienced quite a learning curve along the way. 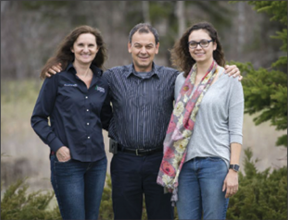 Ice River Springs Executive Vice President Sandy Gott, CEO Jamie Gott and Sustainability Manager Crystal Howe. Beginning as a supplier of spring-fed water, Ice River Springs built its own recycling plant, named Blue Mountain Plastics, in 2010 in Shelburne so it could produce recycled content for its caps and bottles. At first, the company considered using aseptic packaging. “But we found that a lot of those carton-based packages were not entirely recyclable,” she says. Then Ice River Springs tried plant-based resin. But bottled water needs a two-year shelf life, Gott says, which polylactic acid (PLA) cannot provide. Blue Mountain Plastics purchases and processes 85 percent of the PET that’s collected in Ontario’s curbside recycling program. The facility benefits from the good material supply in the area. In addition, it purchases infeed material from other provinces and from nearby areas in the U.S. The kinds of recyclable material Ice River Springs has received from all its sources have shaped the company’s approach and decisions, Gott says. Ice River’s 15-liter cooler bottle made with 100 percent recycled postconsumer green beverage bottles. In 2014, the company started bottling its Ice River Springs brand water in green bottles, recognizing that it was getting many more green bottles than it had expected. Ice River Springs Green water is distributed nationally in Canada and has some buyers in the U.S. as well. In addition to single-serving bottles, the water also comes in 4-gallon jugs. “That’s gone quite well for us, to the point where we’re actually now purchasing green bales from other recyclers that are sorting out colors to get enough supply,” Gott says. The blue bottles go to Ice River Springs’ private-label customers—a segment that constitutes the bulk of the company’s water business. The bales Ice River Springs buys from its material sources contain plastics other than PET, so the company developed a way to put those materials to use. It forged a partnership with C.R. Plastic Products Inc., Stratford, Ontario, which buys high-density polyethylene (HDPE), including bottle caps, from Ice River Springs. C.R. uses this postconsumer plastic to make outdoor chairs. HDPE accounts for 7 percent of the material Blue Mountain Plastics receives for processing. Two years ago, Ice River Springs bought controlling ownership of C.R. Blue Mountain Plastics takes the baled bottles and turns them into clean flakes. Then, using equipment from American Starlinger-Sahm Inc., Fountain Inn, South Carolina, the bottles are transformed into food-grade resin pellets. When Ice River Springs started this process in 2010, using rPET in food-contact applications was relatively new. By closing the loop and producing the material that goes into the bottles, the company has achieved greater material consistency—and that’s led to improvements in the injection molding of its preforms as well as in the blow molding of its bottles. “Before we set up our own facility, we had to go and buy our PET pellets on the open market,” Gott says. “What we found is that there was a lot of inconsistency between batches. So, it was difficult for us to set our injection equipment to really process it the same each time. We could get to about a 50 percent recycled plastic content before we really started to see operational impacts from doing it. From 2002 to 2017, Ice River Springs reduced the weight of its bottles by more than half and cut energy consumption and greenhouse gas emissions by 78 percent. The company also eliminated corrugated trays used to package its bottles and developed a nested packing configuration for the bottles that saves room during transportation. Today, Ice River Springs owns six bottling plants in Canada and seven in the United States and employs approximately 600 people. Blue Mountain Plastics covers 160,000 square feet in Shelburne. Gott says the facility recycles more than 400,000 bottles per hour. Blue Mountain Plastics increased its capacity last year, upgrading parts of its line to increase speed. She declined to specify Ice River Springs’ customers but says they include most of the larger retailers and food service providers in Canada. In the U.S., Ice River Springs is a growing player, serving as one of the top five private-label bottled water companies. 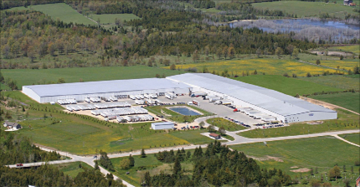 An aerial view of Ice River Springs’ Feversham, Ontario, plant. The author is a correspondent for Plastics Machinery Magazine. This article appeared in the summer issue of Plastics Recycling magazine, a supplement of sister publication Recycling Today and Plastics Machinery. BioCapital Holdings says it has designed a plastic-free, compostable single-use coffee cup. The NextGen Cup Challenge will select the top 30 designs in December, and six finalists will be announced in February 2019. These six companies will have the opportunity to work with a wider pool of corporations to scale production of their cup ideas. BioCapital Holdings describes itself as a bio-engineering start-up that strives to produce compounds and materials that are biodegradable and friendly to the environment, with applications in several industry sectors. NWRA and other stakeholders say the law unfairly singles out transfer stations. A coalition of New York City businesses, residents and the Arlington, Virginia-based National Waste and Recycling Association (NWRA) filed a lawsuit Nov. 16 challenging a city law that requires more than 20 transfer stations located in Brooklyn, Queens and the Bronx to cut the amount of waste they process. The amount is far below what their state and city permits allow, NWRA says. The petitioners include city transfer stations, residents and the association representing the solid waste industry in New York City. Local Law 152, which was signed into law in August, was created to reduce the amount of waste that can be taken at transfer stations in four neighborhoods that bear the brunt of the city’s waste management infrastructure, according to New York City's website. NWRA says the law, which takes effect in 2019, singles out certain transfer stations and requires them to reduce their legally permitted capacity anywhere from 33 to 50 percent. In a press release, NWRA says Local Law 152 “hobbles the capacity of the New York solid waste industry to serve the public with safe, environmentally sound and economical garbage management.” The release also says the city ignored required environmental reviews in order to pass a law that does not improve the environment and will instead increase traffic and air pollution. Over the last ten years, NWRA says the coalition bringing this lawsuit tried to negotiate with the city to agree to lawful and fair reductions in transfer station volumes across the city consistent with the city’s management plan. NWRA says the city ignored these efforts, as well as the advice from the city’s department of sanitation, and refused to negotiate. The city's website says the law, once known as the "Waste Equity bill," will also prohibit the creation of new waste transfer stations in neighborhoods that handle at least 10 percent of the city’s waste. The city says the law marks the final chapter of the city’s Solid Waste Management Plan, which is meant to dramatically reduce truck traffic associated with waste collection and hauling in neighborhoods historically overburdened by waste processing infrastructure, including North Brooklyn, the South Bronx and Southeast Queens. The city's department of sanitation estimates that this bill will move between 1200 and 1800 tons per day of waste out of these neighborhoods, which means 120 to 180 trucks per day (on average) will no longer dump waste in these four overburdened community boards, and about 60 tractor trailers per day that will no longer haul waste out of these neighborhoods. Three others sustained injuries in the accident at U.S. Ecology in Idaho. An explosion at a U.S. Ecology waste plant on Nov. 17 in Grand View, Idaho left one employee dead and another three with non-life-threatening injuries. U.S. Ecology, based in Boise, Idaho, houses a facility in Grand View that processes and converts hazardous inorganic wastes into non-hazardous, delisted residues. The explosion happened at 9:23 a.m. during a routine process inside one of the buildings at the facility, U.S. Ecology says in a press release. Fifteen U.S. Ecology employees were working during the time of the explosion. Three sustained injuries, while Monte “Alex” Green, a 48-year-old equipment operator who was moving materials at the time of the explosion, passed away from his injuries. The incident is under investigation both internally and externally by the U.S. Ecology executive team, the Environmental Protection Agency’s (EPA) Boise Team and the Occupational Safety and Health Administration (OSHA).